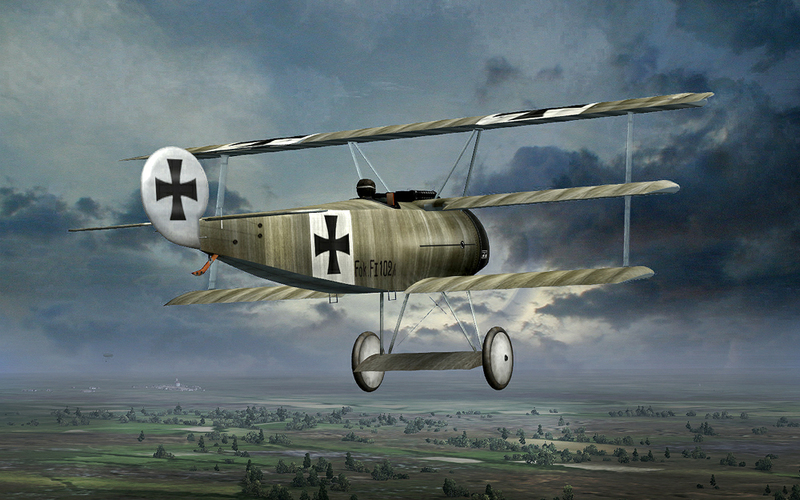 Compared to the Albatros and Pfalz fighters, the Dr.I offered exceptional maneuverability. Though the ailerons were not very effective, the rudder and elevator controls were light and powerful. Rapid turns, especially to the right, were facilitated by the triplane's marked directional instability. The Dr.I was considerably slower than contemporary Allied fighters in level flight and in a dive. While initial rate of climb was excellent, performance fell off dramatically at higher altitudes due to the low compression of the Oberursel Ur.II, a clone of the Le Rhône 9J rotary engine. As the war continued, chronic shortages of castor oil made rotary operation increasingly difficult. The poor quality of German ersatz lubricant resulted in many engine failures, particularly during the summer of 1918. 2) After downloading extract the archive and put folder FokkerDr1 to your MODS, #SAS or #DBW folder within your Il-2 modded install directory. 1# If engine won't start at first time, try starting it again. 2# Plane has no wheel brakes. 3# Guns are fired separately as it was in real-life Dr.1, you must chose weapon 1+2 to fire them at once. Thanks to SAS~Anto for this plane there was developed special kind of advanced engine management. You can change current power on rotary engine in 3 ways: by changing magnetos, throttle and mixture. With Magento in setting one, throttle can be changed from 0% to 33% of power. Setting 2, maximal power is 66%, minimal 33%. At Magneto 1+2, maximal 100% minimal 66%. Also you can change power by changing mixture level at the same time. You outdo yourselves gentlemen, congratulations. She flies like a charm! Aviator Mod Team, Lisek - Thanks to all involved! but I have a very strange behavior, the fokker DR1 doesn't move in the sky and remains static.... however the propeller turns !! A dream comes true. It flys great. Thanks very much and Happy Holidays to you all. Many thanks for all of the teams work on this. Brilliant, absolutely magnificent little machine, crashed and burned twice already ... I love it. Well done AMT, this is special. Thank you guys this is gonna be a good xmas! Best Christmas present this year!